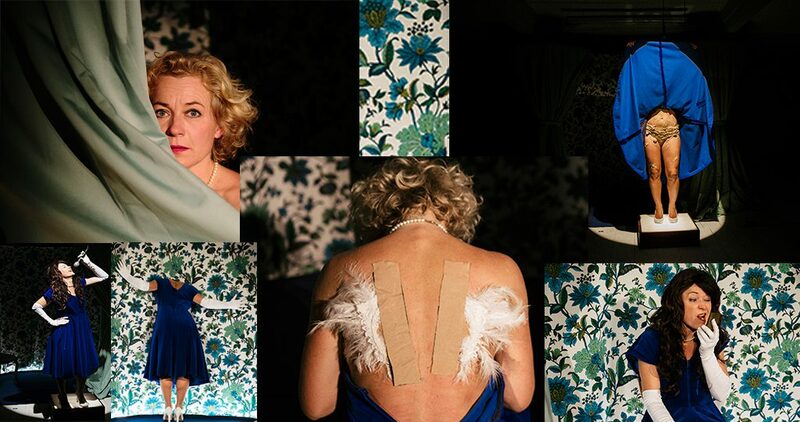 A VISUAL PERFORMANCE ABOUT IDENTITY AND APPEARANCES – BASED ON A METAPHORICAL COSTUME. Theatre artist Helene Høm and Undreværket creates with “Strip Tease” a funny and honest psychological portrait, using a strong visual imaginary to uncover the complexities and paradoxes of human nature today. DESCRIPTION: IN A FLOWERY DIORAMA* A WOMAN IS EXPOSING HERSELF TO THE EYES OF OTHERS, TRYING TO MAKE THE BEST OF HERSELF. UNFORTUNATELY THINGS KEEP GOING WRONG. THE WHOLE THING TURNS OUT TO BE AN UNEXPECTED ”STRIPPING” IN FRONT OF THE AUDIENCE, SHOWING MODERN FEMALE IDENTITY IN A RELENTLESS SELFIE AGE, WHERE IDENTITY IS MISUNDERSTOOD AS SUCCESS , YOUTH AND OUTER APPERANCES. BUT WHAT’S UNDER? ”STRIP TEASE” TAKES THE SPECTATOR TO AN INTIMATE AND PECULIAR WORLD, WHERE FASCINATION, AESTHETICS AND DISGUST GO TOGETHER. A WORLD FULL OF FAILURE AND BEAUTY, OF VULNERABILITY, SCARS, SECRETS, LAUGHS AND OF UNEXPECTED SURPRISES. MUSIC ARTIST AND COMPOSER GRY NÆHR BAGØIEN HAS CREATED A MAGICAL AND MOODY UNIVERSE TO THE PERFORMANCE . SOUNDS AND SONGS, THAT MAKE YOU THINK OF DAVID LYNCH MOVIES, DRUNKEN LEONARD COHEN SONGS AND OLD LADIES TAKING TANGO LESSONS. STAGE AREA: MIN B:5 x D:6 x H:2,5 M.
HELENE HØM was born on the Danish island Bornholm 1972. She studied BA in visual theatre arts and graduated from ”Norwegian Theatre Academy” in 2004. Today Helene Høm works interdisciplinary, combining methods, expressions and references from classical and modern theatre with visual arts. Since 2005 she has especially worked on metaphorical costumes. “Strip Tease” is created through this research. In 2016 she opened the Theatre Undreværket (Wonderwork) with actor Thomas Danielsen – in Gudhjem on the rocky island Bornholm. Undreværket creates and shows professional theatre and performances from this small island in the Baltic Sea.